DOTComm provides technical support for more than 5,000 government employees throughout Omaha and Douglas County. With users spread across 120 different locations, DOTComm employees require constant access to tools to complete their jobs, both in the office and out in the field. Using existing legacy systems, employees did not have mobile access to important documents or the ability to collaborate with their peers. The systems were slow and cumbersome, and more often getting in the way. These slow and costly systems took 6 dedicated employees to maintain, leading DOTComm to search for a new solution. To solve these challenges, DOTComm adopted Chrome browser and G Suite for its fast, secure and productive infrastructure. 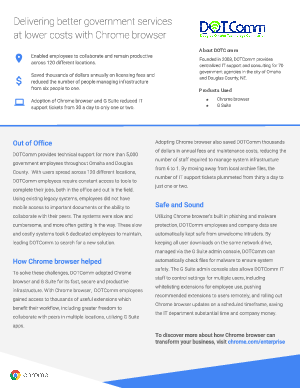 With Chrome browser, DOTComm employees gained access to thousands of useful extensions which benefit their workflow, including greater freedom to collaborate with peers in multiple locations, utilizing G Suite apps.